The synthetic turf used on the field helps stand up to the heavy use such as in sports, requires no irrigation or trimming and the overall upkeep on the field is less then using real grass. The building of the new field was made possible by a $1 million donation from Stan Fulton. There was 74 tons of sand used on the new field as well as 170 tons of rubber infill. The highlights of the new field include the incredibly detailed Pistol Pete at the 50-yard line, the state of the art drainage system and storm sewer, which will be completed in full within the next several weeks, and the overall sharp and defined markings of the field. The artificial turf replaces the Hybrid Bermuda that was used from 1978-2013, which included a quick-draining system beneath the playing surface, was the first Hybrid Bermuda turf of its kind. Aggie memorial Stadium has been the dedicated playing field for NM State since Sept. 16, 1978, when the Aggies christened the field with a 35-32 victory over I-10 rival UTEP. Eight of the top 10 crowds in the history of the stadium came against UTEP. The stadium seats 30,343 fans. The field was constructed for $4 million and was funded by the New Mexico State Legislature as part of a capital outlay program. NM State will showcase the new turf during the season opener against Cal Poly, Thursday, Aug. 28 with kick-off set for 6 p.m. (MT). 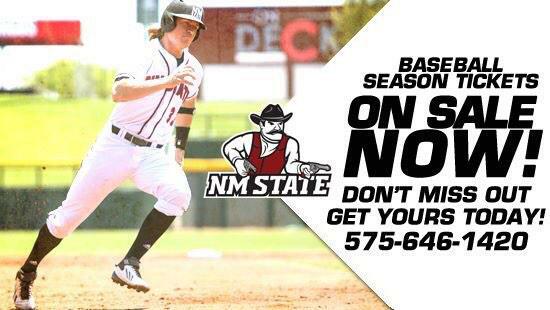 Call 575-646-1420 for ticket information.